Celebrate 30 years of Sisters in Crime with us! Meet and chat with our fabulous WriteNow! 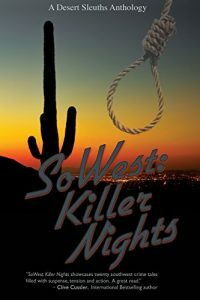 2017 guest speakers and fellow sleuths and participate in the release of our brand new Sisters in Crime Desert Sleuths Chapter anthology, SoWest: Killer Nights! Complimentary light hors d’oeurvres and soft drinks, plus Anniversary Cake. No Host Bar for other beverages. We apologize for any inconvenience but due to unforeseen circumstances, Clive and Robin’s presentations have been swapped in the time slots. The below is the most current information.